Silver Merax Sentern ES186816 is a mid-2018 model hot new release electric clear ice maker with a stainless steel exterior and a powerful compressor. It is a portable countertop model with an ice making capacity of 48 pounds each day and a 2.4 lb. water tank. It first appeared at Amazon.com on June 25 this year and is very new on the market. So there aren’t many customer reviews yet but is currently a 5 out of 5-star product at the time of this review. You’ll get denser and tougher clear ice cubes that won’t melt as quickly as the soft and chewy ice from other ice machines and without any sign of cloudiness. And when you put these ice cubes into your glass, your drink will not be diluted but will get cooled without losing the quality and the taste. It has a powerful and quiet compressor that offers efficient ice production for you to enjoy very clear ice cubes in a quarter of an hour. You can choose from three sizes of ice: Large, medium and small as you adjust the cooling time. And you can store 2.4 lb. of ice cubes in its ice bucket before you need to empty it. These are very hard ice cubes that will not melt very quickly but the ice maker is not a freezer so you either use the ice cubes or transfer them into your freezer. 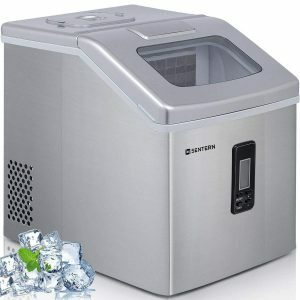 Silver Merax Sentern is a sleek, compact and portable, countertop style, stainless steel ice maker with the dimensions of 11.2 x 14.4 x 13.8 inches. It is both sturdy and durable and is easy on the eyes with its sleek and modern design and a stainless steel body. You can use it in your home kitchen or outdoors, in your backyard parties, picnics or on your road trips. It has a high-speed exhaust fan that circulates the air from the inside out and the heat dissipates quickly. The water reservoir has a 2.2 liter capacity for a consistent supply of ice. It has a very easy to use, small black LCD-backlit digital display with the On/Off and Timer buttons. You can actually set this ice maker to switch on and of the cycle for your needs. It has a good size transparent window for you to monitor the ice making progress and the ice level. The indicators on the LCD display panel will also give you an idea of what’s going on. You can adjust the ice cube sizes between small, medium and large by adding time to the ice making process. As a single negative, the ice is delivered in blocks and if they are not in single pieces the storage capacity will be decreased. 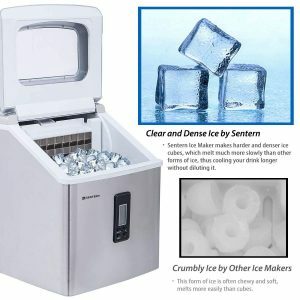 It is an FDA approved (benefits outweigh the risks) and ETL certified (complies to North American safety standards) ice maker that is perfectly safe and healthy to use. You will not need to do any assembly work and is ready to use straight out of the box. Overall you seem to be getting quite good value for money. Just bought a Serntern Ice maker. Love it already. Ice is hard and doesn’t’ melt quickly. I’d like to order a replacement silicone plau and replacement screw on cap for the drain, in advance of needing them. However, the Customer Service website listed on the manual (service@senternbrand.com)does not go to customer service. It goes to an array of random icemaker sites, etc. How can I get in touch with their parts dept.? There is not a parts list in the manual, either. Please try contacting the seller via Amazon.com or ask the Amazon customer support team. We only review the products. Thanks.